An ancient, red giant star in the throes of a frigid death has produced the coldest known object in the cosmos — the Boomerang Nebula. How this star was able to create an environment strikingly colder than the natural background temperature of deep space has been a compelling mystery for more than two decades. The answer, according to astronomers using the Atacama Large Millimeter/submillimeter Array (ALMA), may be that a small companion star has plunged into the heart of the red giant, ejecting most the matter of the larger star as an ultra-cold outflow of gas and dust. This outflow is expanding so rapidly — about 10 times faster than a single star could produce on its own — that its temperature has fallen to less than half a degree Kelvin (minus 458.5 degrees Fahrenheit). Zero degrees Kelvin is known as absolute zero, the point at which all thermodynamic motion stops. The ALMA observations enabled the researchers to unravel this mystery by providing the first precise calculations of the nebula’s extent, age, mass, and kinetic energy. “These new data show us that most of the stellar envelope from the massive red giant star has been blasted out into space at speeds far beyond the capabilities of a single, red giant star, ” said Raghvendra Sahai, an astronomer at NASA’s Jet Propulsion Laboratory in Pasadena, California, and lead author on a paper appearing in the Astrophysical Journal. “The only way to eject so much mass and at such extreme speeds is from the gravitational energy of two interacting stars, which would explain the puzzling properties of the ultra-cold outflow.” Such close companions may be responsible for the early and violent demise of most stars in the universe, Sahai noted. “The extreme properties of the Boomerang challenge the conventional ideas about such interactions and provide us with one of the best opportunities to test the physics of binary systems that contain a giant star,” adds Wouter Vlemmings, an astronomer at Chalmers University of Technology in Sweden and co-author on the study. The Boomerang Nebula is located about 5,000 light-years from Earth in the constellation Centaurus. The red giant star at its center is expected to shrink and get hotter, ultimately ionizing the gas around it to produce a planetary nebula. Planetary nebulae are dazzling objects created when stars like our sun (or a few times bigger) shed their outer layers as an expanding shell near the end of their nuclear-fusion-powered life. The Boomerang Nebula represents the very early stages of this process, a so-called pre-planetary nebula. When the Boomerang Nebula was first observed in 1995, astronomers noted that it was absorbing the light of the Cosmic Microwave Background, which is the leftover radiation from the Big Bang. This radiation provides the natural background temperature of space — only 2.725 degrees above absolute zero. For the Boomerang Nebula to absorb that radiation, it had to be even colder than this lingering, dim energy that has been continually cooling for more than 13 billion years. 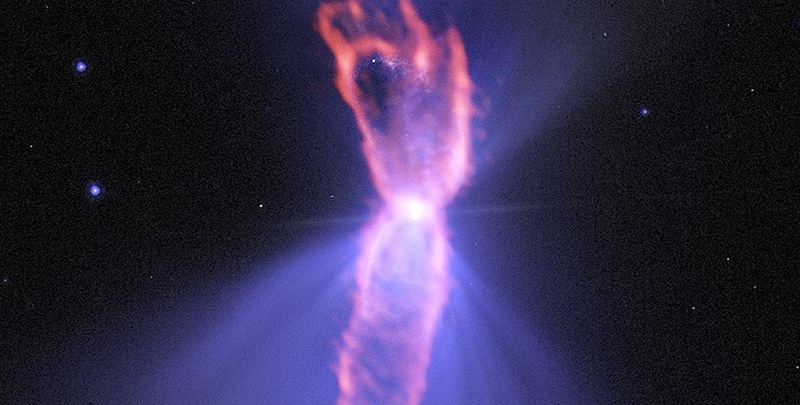 The new ALMA observations also produced an evocative image of this pre-planetary nebula, showing an hourglass-shaped outflow inside a roughly round ultra-cold outflow. The hourglass outflow stretches more than three trillion kilometers from end to end (about 21,000 times the distance from the Sun to the Earth), and is the result of a jet that is being fired by the central star, sweeping up the inner regions of the ultra-cold outflow like a snowplow. The ultra-cold outflow is more than 10 times bigger. Traveling more than 150 kilometers per second, it took material at its outer edges approximately 3,500 years to reach these extreme distances after it was first ejected from the dying star. These conditions, however, will not last long. Even now, the Boomerang Nebula is slowly warming.